<b>Final Dawn. 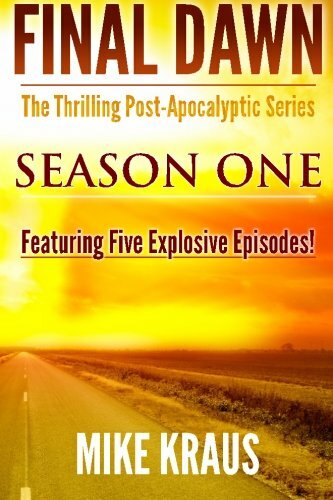 The bestselling series with over 21,000 copies sold in just over 3 months.</b> <br /> Now get all five explosive episodes in one convenient package! <br /> These first five episodes comprise the first season of Final Dawn: The Thrilling Post-Apocalyptic Series. Inside you'll find one of the most unique post-apocalyptic thriller stories ever written. <br /> <i>When the end of the world arrived, it came not with a bang, as most expected, but with more of a &quot;pfft&quot; instead.</i> <br /> Humanity has been torn asunder and brought to the edge of total annihilation in less than an hour. For those who died, it was a quick death, so fast that their brains didn't have time to process the pain signals from their nerves. For those who survived, the true horror is about to begin as they struggle to not only stay alive, but find out what happened to bring such a quick end to the world as they knew it. <br /> Final Dawn is a thrilling new post-apocalyptic series that follows the journey of four people who survived the end of days. <br /> <br /> <b>Leonard McComb</b> - A grizzled veteran of the New York City sanitation department, trapped underground in the city's vast sewer system when the world ended. <br /> <b>Nancy Sims</b> - An accountant, traveling across the plains of the Midwest towards a new job, caught in the middle of nowhere, destruction all around her. <br /> <b>Marcus Warden</b> - A self-made millionaire from New York, vacationing in a national forest of West Virginia when the bombs fell. <br /> <b>Rachel Walsh</b> - A wife and mother whose family is swept away in the blink of an eye, struggling with her loss and the dawning realization of what may have truly transpired to bring about the end of the world. <br /> <br /> Final Dawn will continue to be released in a short, inexpensive episodic format, with a minimum of 1-2 issues coming out each month. A total of 5-7 episodes will constitute each 'Season' of Final Dawn, and at the end of each season, a single book with all the episodes from that season will be released in both Kindle and paperback format. Episode 5 marks the conclusion of Season 1, with a new season starting in Dec 2012/Jan 2013. A total of 3-4 seasons are planned, with 5-7 episodes each. Mike Kraus is a new indie author making his debut with Final Dawn, a thrilling post-apocalyptic series that will be released in episodic format. Mike has been a writer for several years, but this will be his first foray into fiction that is being published for public consumption. Mike currently lives in southern Mississippi with his wife and two children, and spends his days writing, programming and tinkering on his PC. You can follow the progress of Final Dawn on Facebook (www.facebook.com/finaldawnbook), Twitter (www.twitter.com/finaldawnbook) or on the official Final Dawn website (www.finaldawnbook.com).